A luxury sedan without a lofty price, the Nissan Maxima was entirely redesigned for 2016. It took design cues from the the reigning supercar, the Nissan GT-R as well as the renowned Blue Angels fighter jets. A combination like that makes for an athletic and wildly aerodynamic build while speed and aggression comes naturally. Best of all, its power source is the trusted and mighty 300-horsepower 3.5L V6 engine. 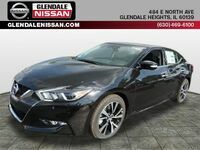 The 2017 Nissan Maxima in Glendale Heights, IL now has had a year to settle into its new design and is just waiting to be tamed by a driver daring enough to break free from the daily driving monotony that so many have fallen into. As a full size sedan, the Nissan Maxima is still the safe and practical car it has always been, but that doesn’t mean it can’t show off some thrilling performance and technology. Across the 2017 Nissan Maxima trim lineup, the same heart-pounding 300-horsepower 3.5L V6 engine is found. Even with all of the fun giddy-up, it manages a modest fuel economy rating of 21 city/ 30 hwy mpg. The 2017 Nissan Maxima is offered in six trim levels, one of which is the all-new SR and the SR Midnight. Each trim continues to build on luxurious creature comforts. The lineup is as follows: S, SV. SL, SR, SR Midnight, and Platinum. Nissan says the 4-door sports car is back, and it’s hard to argue with that when you look the Maxima in the eye, aka the signature lighting. The muscular hood and boomerang-shaped headlights that sweep back fluidly stand out against its sleek and curvy body. Built to be aerodynamic, its fighter jet body and floating roof line give it a modern and more aggressive style. Beneath its chiseled body are three sets of wheels that can be picked from: 18 or 19-inch machine-finished aluminum-alloy wheels or the 19” gloss black aluminum-alloy wheels. The 2017 Maxima’s sleek and aggressive style alludes to the driving style you can expect when taking the wheel. The Drive Mode Selector allows you to switch from Normal Mode to Sport Mode, which makes for a sharper throttle response and heavier steering. The best way to experience the dynamic handling of the 2017 Nissan Maxima is to take it for a test drive. The Xtronic CVT allows for fluid shifting throughout the gears, while the suspensions and independent subframe-mounted strut allow the Maxima to eat up any corners, no matter how sharp. To learn more about the latest Nissan Maxima, we would like to welcome you here to Glendale Nissan. We would be happy to answer any questions about the Maxima and tell you more about its safety features, family-friendly interior with plenty of space for all passengers, and state-of-the-art-technology it's packing!